I said “no” to lunch with friends, “no” to networking meetings, “no” to opportunities to teach or speak. No, no, no. I said no more than ever before. As my calendar cleared, so did my mind and I began to understand why I felt compelled to write a book. Deep down I feel called to share my journey with you—my breakdowns and breakthroughs—how I’ve unpacked my mind and heart and put myself back together in a whole new way. Deep down I know the clarity and fearlessness I’ve discovered, you can discover too and the tenderness and joy I’ve experienced, you can experience too. This resounding, “yes” pulled me out of bed at 4:00 am every morning and sat me down at my laptop for hours and hours. It guided me to say no to non-essential activities—stuff that got in the way of writing and, over the past month, directed me into more and more stillness and silence. My yes carried me through weeks of writing and sleeping, writing and sleeping. My yes got it done. If you want to be inspired and inspire others, you’re going to want to find out. You likely have a few answers. Some may stand out today and others tomorrow. 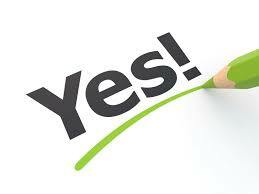 Identify your “yes” in the morning and notice how it directs your focus. Let your “yes” guide you when to say no in your daily life. Let your “yes” help you lean into life in a whole new way. Let your yes inspire you to show up and shine. I’ll warn you though once you’re aware of it, you may start getting up at 4:00 am, and you may start saying “no” more and more, but once thing’s for sure, your “yes” is definitely worth getting to know. I’d love to hear from you. If you know your “yes,” please share. Not only will your “yes” inspire others but it’ll also feel great to proclaim it to the world.